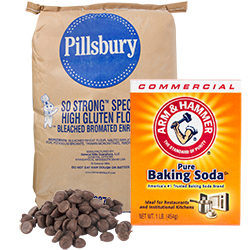 Find essential dry baking ingredients like flour, sugar, and baking powder in bulk quantities to accommodate even your biggest batches. 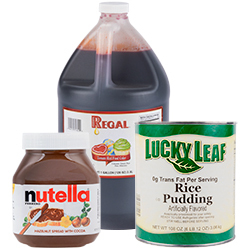 Liquid baking ingredients like extracts, honey, and icing are sure to fit your everyday baking needs not matter what the recipe is that you're making. 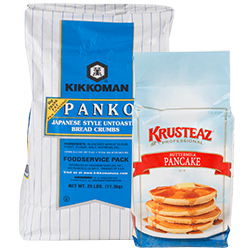 Whip up your own homemade pretzels, cakes, or pancakes with our offering of breading and mixes. With this selection of grains, you can find everything from simple breakfast solutions to hearty side dishes that complement your entrees. 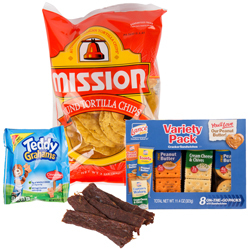 Choose from an assortment of both sweet and salty snacks to provide in your deli, restaurant, or convenience store. 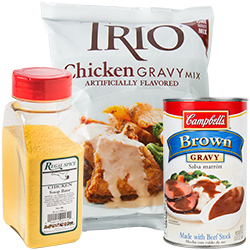 Add gravy to the top of mashed potatoes, or use a soup base to construct a hand-crafted soup of the day with our selection of bases, gravies, and broths. These ingredients and snacks are essential additions to any establishment’s pantry. With an assortment ranging from pasta to cookies, you can find the products you need to complete your breakfast, lunch, and dinner services. Plus, you can find these ingredients and snacks in bulk quantities to prepare for your busiest rushes. For related products, check out our bread and loaf pans, commercial sandwich and salad prep refrigerators, and serving utensils. If you're wondering where to buy ingredients and snacks, we have a large selection of ingredients and snacks for sale at the lowest prices. Whether you own a corner deli or a high-volume cafeteria, these ingredients and snacks can accommodate your needs. Bakeries and restaurants can find ingredients including flour, sugar, and extracts to create the perfect baked goods. Plus, grains like pasta, quinoa, and rice are perfect for making hearty stews, salad bowls, and vegetarian entrees. Additionally, you can find dried beans for an extra touch of protein with a long shelf life. To complement your lunch offerings, serve snacks like crackers, chips, and pretzels. Some options are individually wrapped, so you can provide sides for your on-the-go customers. After their meal, you can offer refreshing mints and candies that cater to guests who have a sweet tooth. 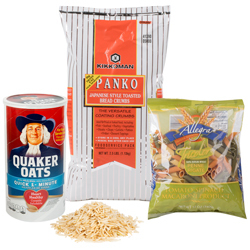 Our selection of dry goods come from wholesale food suppliers for restaurants and are offered at competitive prices.